I’ve been suffering from the winter blues this year more than ever. 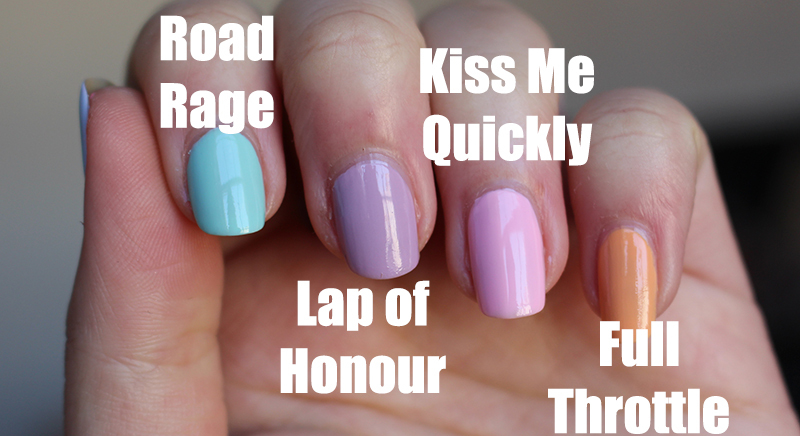 I just really miss the sunshine and the warmth which is why I am so excited by the release of Barry M’s Speedy Quick Dry Nail paints in perfect spring shades! Hoping spring is around the corner! Barry M are one of my favourite affordable nail polishes; their Gelly range is fabulous, I love all the colours! 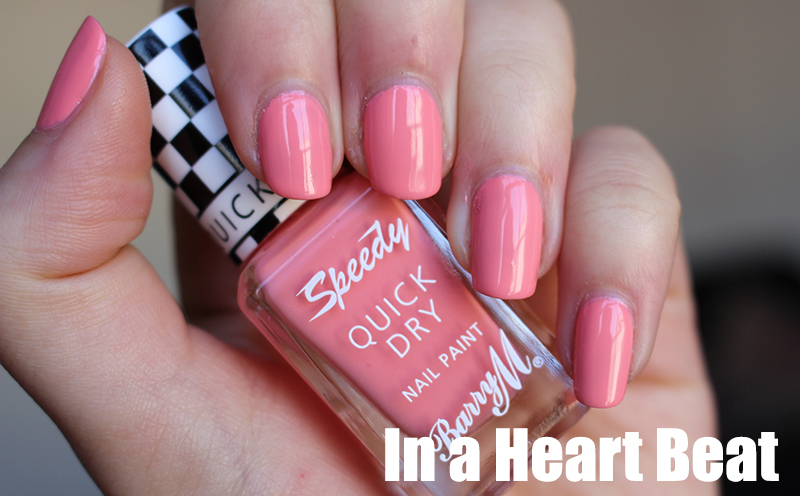 The Speedy Quick Dry is no different, I am in love with all nine shades of polish (although I would prefer 10, it’s just a nicer number), they’re beautiful pastels, perfect for spring and summer. Recently I have been quite lazy with nail polish, skipping it all together as I find it just takes too long to dry so I was really excited to see how these perform. The quality of the polishes really varies depending on the colour with some being a little streakier than others but most require two thin coats (possibly three) for an even coverage. I think the key with these is really the thin coats as it can get quite thick and in turn, quite streaky but with careful application I think they’re great. In terms of drying time, I applied two coats waited 10 minutes and got on with normal life, although they are a touch dry at about 5 minutes. I’ve heard a lot of people say that these aren’t that exciting as they use quick drying top coats but sometimes when I’m in a rush I don’t have time to also apply a top coat making the drying time a real selling point for me. I do find these chip quite easily and I only got 3/4 days wear (slightly less than usual) but I still find them very convenient. My favourite colours are Stop The Clock (a pale yellow), Eat My Dust (pastel blue) and Pit Stop (pastel grey) plus I love the racing themed names and lids! The real selling point of these polishes remains the colours although I do love that the dry quickly. In a heartbeat is gorgeous! these are great for the summer, such a great color range. Great post ! I love seeing the words quick dry on polishes! These are so pretty, especially keen on in a heart beat shade. I love this new collection, the colours are bight & fresh looking. I can't wait for Spring. 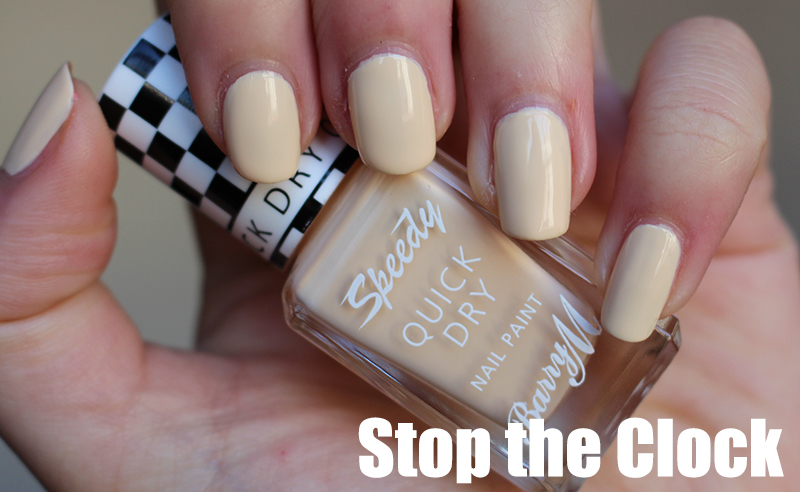 These are a great idea but Barry M always chip really quickly on me, lovely shades though! Oh my. These colors are so perfect for spring. I love the pastels. Lap of Honour has to be my favorite. This'll be perfect for me as well, I'm so inpatient! I am in love with all of these shades!! They are so lovely for spring, I will definitely be picking some up! all these colours are so good! love stop the clock the most! These would be perfect for in the week when I am pressed for time. Gorgeous choice of colours too. I love all of these colours so, so much! These are amazzzzzing! Pit stop and eat my dust are definitely my favourite of the shades!